Corn, chile, and potato soup from Bon Appetempt, A Coming-of-Age Story (with recipes!). The other week while the Antarctic Vortex tried to freeze us all in our sleep I made a soup which reminded me summer does still exists somewhere out there. This soup looks summery, tasted fresh but also warmed my belly which was just what I think we all needed. As much as I wanted it to snow in the Sydney area I live in, it didn't. It just got bitter cold and with no heating in our apartment (except for the oven which works surprising well on occasion) it was fun for all of about 10 minutes. I made Amelia Morris' corn, chile and potato soup from her book 'Bon Appetempt - A Coming-of-age story (with recipes!)' - which is a great memoir by the way. This isn't just another potato soup or corn chowder. This is topped with corn chips, avocado and grated cheese. Yes you read right.... corn chips, avocado and grated cheese. Um yum! 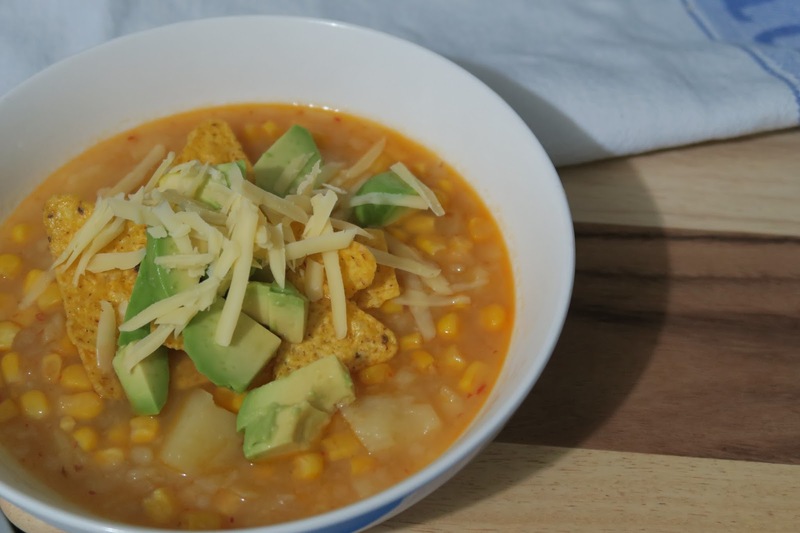 The corn chips on top give the soup crunch while the avocado which is covered in zesty lime juice cuts through the sweetness of the corn kernels and smoky-ness of the chipotle chillies. This is a great winter recipe when you are a little sick of the heavy winter stews and soups and crave for something with a freshness to it but that is still going to warm you up. It would also make a great mid-summer soup to have when we start getting cooler nights because it's like the middle-man...you can equally enjoy it in winter as much as you can in summer. I am completely smitten with this recipe. 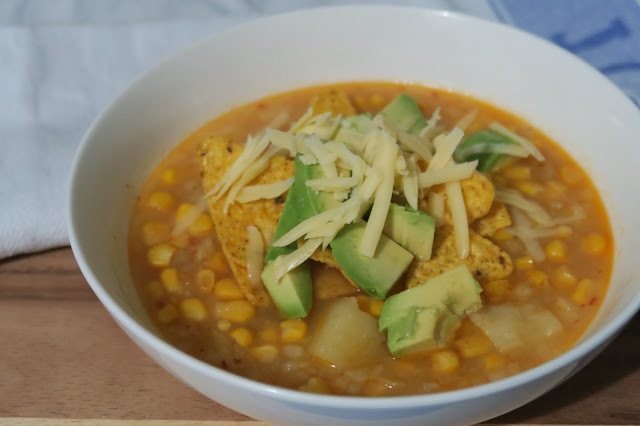 Have you ever made soup and topped it with corn chips, avocado and grated cheese?? I know I certainly haven't until now but if you have, please share the recipe with me at once! - Heat oil in a large heavy based saucepan over a medium heat and add onion, ad a few pinches or salt and some pepper. Cook until the onion softens, about 4 to 5 minutes. - Add potatoes, chicken broth, water and another pinch of salt and bring to a boil and add the minced chipotle chile. Bring it to a simmer and cook until the potatoes are tender, about 15-17 minutes. - Meanwhile, slice the avocados into strips and place into a bowl. Sprinkle with salt and pepper and cover with half of the lime juice. - Using a potato masher, mash the potatoes right in the soup until coarsely broken up. Add the frozen corn and simmer for about 2 minutes more, until heated through. Turn the heat off and add the juice of lime. Give it a good stir and taste to see if you need to add more salt and pepper. - Serve and top with broken up tortilla chips, sliced avocado, grated cheese and a wedge of lime on the side. 'Let my eggplant go free!' with spaghetti from Food52's Genius Recipes cookbook. If you remember my post from 2 weeks ago about my struggle and failure to cook for one and you decide to keep reading this, you'll find out I still haven't mastered it. BUT what I have done is found a delicious pasta sauce recipe with a rich eggplant and sun-dried tomato sauce which a pretty funky name... 'Let my Eggplant go free'. Yep that the name of the recipe. While Tristan was away this time I made a conscious decision to not let me self get into a frump about cooking for one. However I made enough dinner to feed about 4 people but only me to eat it. It meant lunches for the next couple of days so I wasn't complaining and it also meant I got to pig out on a huge bowl of spaghetti while watching 'Married at First Sight'. This recipe has been around for a few years now but it's been recently re-published in the Food52 Genius Recipes cookbook by Kristen Miglore. 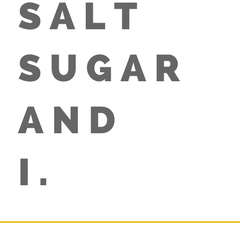 It is another recipe I first saw on Luisa's blog The Wednesday Chef and then put two and two together while flicking through the cookbook, it's not like you come across a recipe name like that every day. So when I saw it on her blog and in Food52's book I just had to make it. I'm not sure mushed the eggplant enough as mine looked a little different. I also didn't have dried tomatoes or basil so I used sun-dried tomatoes in olive oil and parsley since our parsley plant has gone bonkers. I've been putting parsley in everything lately... a bit of neglect and tough love and it's thriving! First I started off salting the eggplant slices which is something most recipes tell you to do when cooking eggplant but I've always skipped this step and never done it. I did however do it this time. I salted my eggplant then jumped in the shower and by the time I was out and dressed again it has been about 20 minutes and the chopping board was full of water. So there is a purpose to this madness of salting. Next I diced it and through it in to the pan with what looked like a huge amount of extra virgin oil but within seconds all the oil was soaked up and the cubes of eggplant looks like they were dry frying. Sometimes I don't understand the next step in a recipe if I haven't made it before until I see it happening. I have to trust the recipe which can be daunting to see what happens. Fry the eggplant until translucent huh? but it's eggplant. After not too long I knew what the recipe meant... sometimes you have to have faith but I have had experiences where I have screamed at books doing exactly what it said and ended up with a lumpy burnt mess. So it's a little hit and miss making something for the first time but theres nothing like a little adventure in the kitchen! After adding some water to the eggplant and letting it simmer away until there was almost no liquid left I mushed it up using a potato masher and the back of a spoon, added the parsley and sun-dried tomatoes. I served it with a pretty decent serving of parmesan I sat down to some trashy tv and a huge bowl of pasta on the couch while the cat snored next to me. This sauce is rich without looking rich. 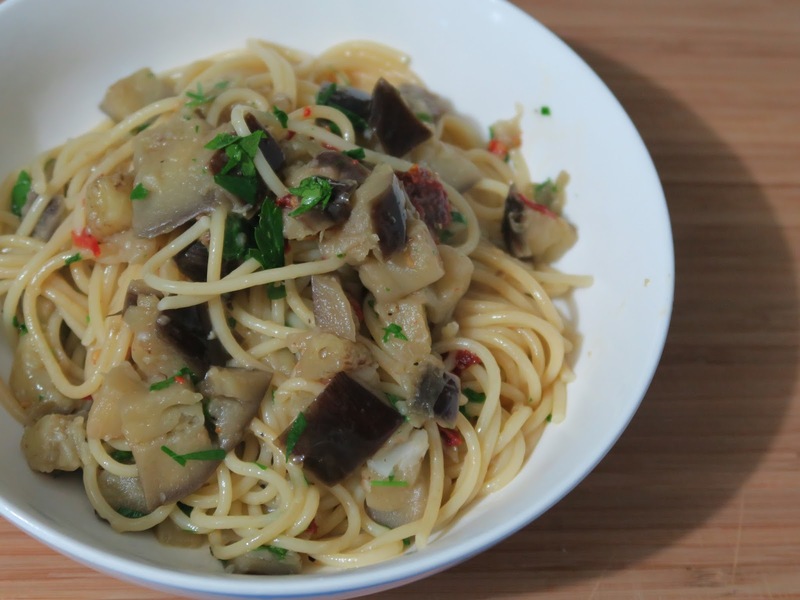 When you start fill your fork with a huge mouthful of spaghetti and try and get a bit of everything on it, all the extra virgin olive oil you put in the pan first is still there in the silky eggplant sauce and coats your lips like a good lip gloss. The herbs thrown in at the end give it a really fresh vibe which I think it needs, maybe even a squirt of lemon juice on top next time. It's not the prettiest but its definitely a winner if you love eggplant, just keep in mind this serves 4 people not 1 person alone with their cat. Recipe by Francis Lam from Food52's Genius Recipes cookbook. - with my variations below. - Lightly salt the slices of eggplant and stack them back together. Let sit for about 20 minutes or so. - Put the olive oil in a heavy saucepan, add the garlic cloves, and set over low heat. - Dry off the eggplant, cut it into chunks. When you start hearing the garlic sizzle a little and can smell it, drop in your eggplant and stir to coat it all with oil (this is where your oil will look like it has disappeared). Turn up the heat a little bit to medium high and add the thyme or oregano and stir. - Cook until the eggplant started to turn translucent and softens. Add the water/stock and let it come to a boil then turn it back down to medium-low. Let it bubble for a bit and cover it, leaving a crack for steam to escape. Stir once in a while so that the bottom doesn’t stick. If it does start to stick add a splash more water/stock. 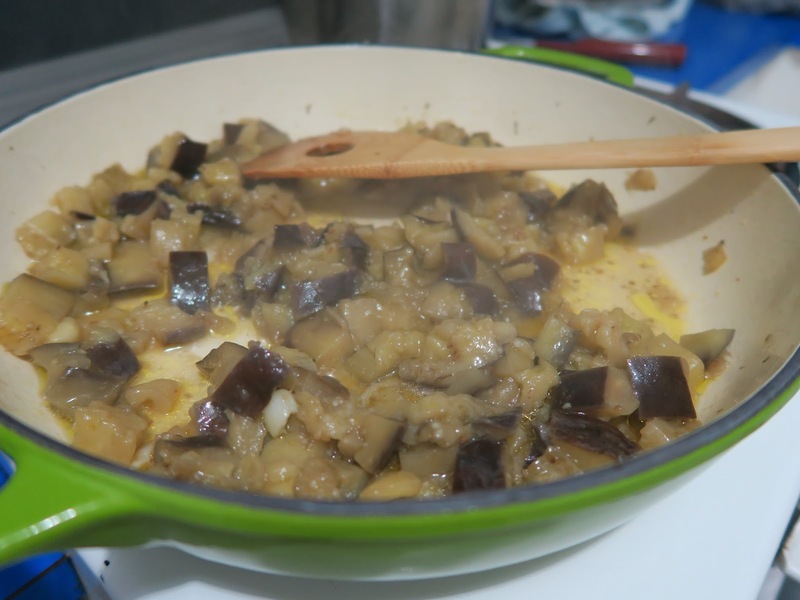 - After about 20 minutes or so, the liquid in the eggplant pan should be mostly evaporated and the eggplant should be soft and melting. Mash it with a fork or spoon (I used a potato masher), and adjust the seasoning to taste. - Meanwhile get the water on a boil for your pasta and cook the spaghetti until al dente. Make sure your spaghetti doesn't sit around waiting for you sauce to cook so try and time it according to the packet instructions to give you an idea of when to put it in the boiling water but always taste to check when cooked. 5. 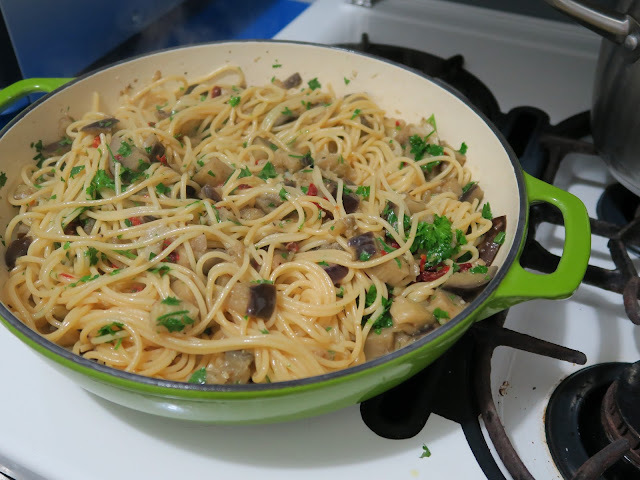 Toss the eggplant mush with the al dente spaghetti. Stir in the minced tomatoes and basil (or parsley). Drizzle with a little more olive oil if you dare and serve with some finely grated parmesan cheese and extra cracked pepper. it all started because i like to eat. Copyright 2014-2019 Salt Sugar and I . Simple theme. Powered by Blogger.